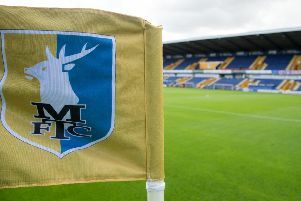 As we settle into two weeks without a game for Mansfield Town, we invite readers to contribute their favourite memories of following the Stags. Here is a contribution from long-time fan Alan Gelsthorpe . . .
My memory is of an unforgettable week in 1965. During this Easter week the Stags played four matches in seven days against Carlisle twice, also top of the Third Division Hull then, I think, the fourth and the final match away at Barnsley. The Stags could not really afford to lose any of these matches, but having already hammered QPR (8-1), Southend (6-1) and rivals for promotion Bristol City (3-0) in recent matches, hopes were high. The Stags started by beating Hull 2-1 in front of what must be one of the highest attendances for a league match at Field Mill, then on Easter Monday dispatched top of the league Carlisle 2-0. Unfortunately the Stags went down 3-0 the following evening at Carlisle. This all meant they had to beat Barnsley away in the last match of the season by several goals and hope Bristol City did not win. The Stags did win 3-2 but so did Bristol. Second Division for the first time. But, no, Bristol had won and went up on the smallest fraction of goal average. I attended most matches that season with my mate Roy Timms. We used to stand in the corner of the North Stand under the floodlight pylon just below the pie stall. Roy’s favourite player was former Busby babe Albert Scanlon and mine was inside forward Harry Middleton. Great memories.